Matt’s background in college athletics allows him to use a strong exercise based program to help patients attain their functional goals. He also utilizes a specialized manual approach to help restore lost function in both the spine and limbs. Matt has special interests in treating Sports Injuries, Total Body pre-post Operative Deficits, TMJ and Spinal Disorders. He has been trained in the McKenzie Treatment for spinal disorders and has received advanced training in pediatric issues, both neurological and orthopedic. Matt uses a hands on approach to assess deficits during a thorough evaluation, then implements individualized plans of care for your personalized treatment plan. Matt sees patients in our Attleboro office on Monday, Wednesday and Friday mornings. 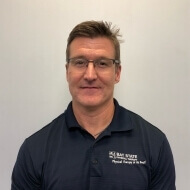 Matt is a Managing Partner with Bay State Physical Therapy and supervises the clinicians in the Attleboro, North Attleboro, Raynham, Somerset, Taunton & Franklin offices. Matt is married and has three children that are all very active in local sports and recreational activities. His family is involved in a number of community events and activities in and around the North Attleboro area.